Astronomical world dairy prices are to see the traditional champagne replaced with milk on motor race winners’ podiums around the globe next year. What started as a tradition in the Indy 500 back in 1936 will next year be extended to Formula One, the World Rally Champs and NASCAR. Super-heated liquid cheese was trialed briefly but ruled too dangerous by the sport’s governing body. Congratulations to Scott on an outstanding drive. 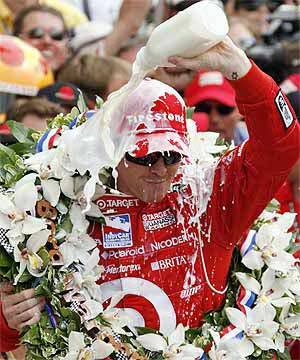 What a wonderful achievement by Scott Dixon. I hope the New Zealand sporting public understands how big the Indy 500 is. He deserves all the success he is having. A great day for Kiwi sport. And an outstanding effort by his team to ensure he was kept well away from our Prime Minister who has developed an uncanny knack of cursing every team or sporting individual she encounters. barnsleybill – You just can’t help yourself eh mate? Grow up, or better still, take it to Kiwiblog. I saw this happen – was pretty stoked for the lad, and thenumber of times NZ was mentioned to a rather substantial international audience. Good on him though, talent and the knack to use it well.